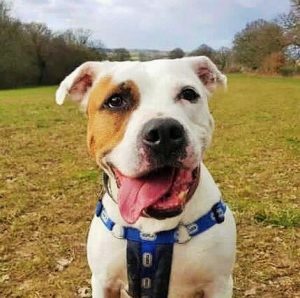 Bubbly boy Buster is a 9 year old American Bulldog cross who came into the care of RSPCA South Godstone in Surrey when his owners were unable to look after him. 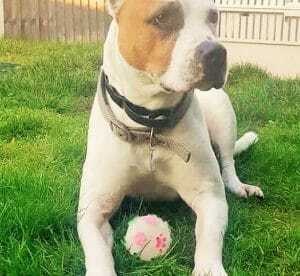 He wants an active, adult only home and, although he makes friends with other dogs OK, he’d rather be an only pet to be the centre of attention. He’s very good, very bright and absolutely loves his walks, almost as much as chews! He’s at the kennel gate ready and waiting before he’s even seen his lead. Buster enjoys gentle strolls and exploring through the woodlands. He is always up for a new adventure. He’s made a few four legged friends here at the centre while out and about. 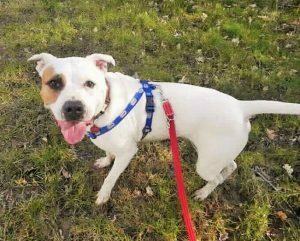 Buster can be a little shy when meeting new people but after a few tasty treats he soon comes around and his cheeky side comes out to play! His adopter will need to visit him a few times to build up trust. Bribes and fuss, allowing him to come to you in his own time, will soon make Buster your best friend! When he’s not receiving a gentle fuss Buster is more than happy to chill out on a comfy bed and rest his head. 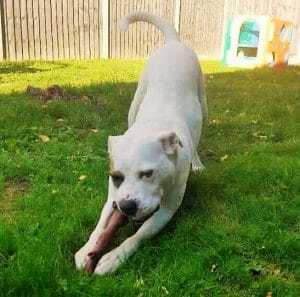 It’s thought that Buster can be left for short periods of time once he is fully settled into his new home. This clever chap is always keen to learn and really gets into his training, which would be a fun way for new owners to build a strong relationship with him. 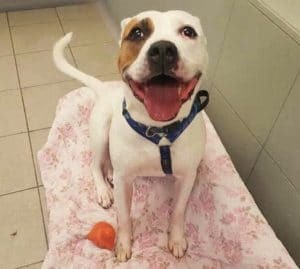 Buster is such a good boy and so clean in his kennel that he has to be taken out for regular toilet breaks at the centre. He’s neutered and healthy apart from a touch of arthritis in his knees, which he’ll continue to take medication for. It doesn’t dampen his enthusiasm for walkies one bit! Please say you saw Buster on the Oldies Club website.